So this week’s challenge was to list the top ten books on our TBR list for this spring. 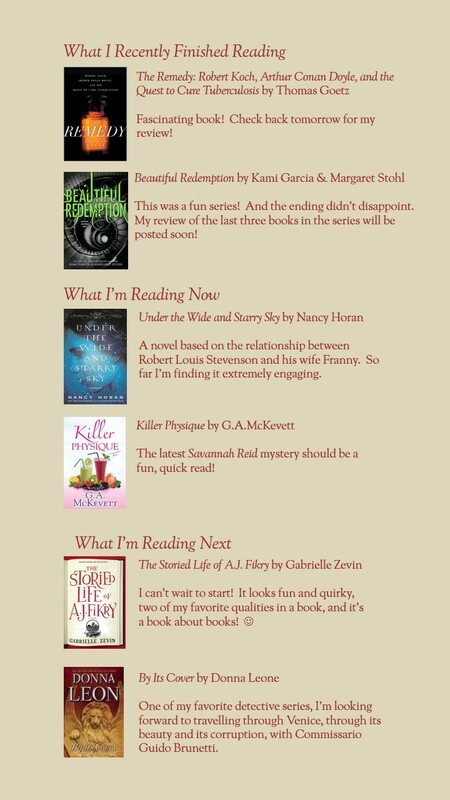 I stuck to books that are being released this spring. 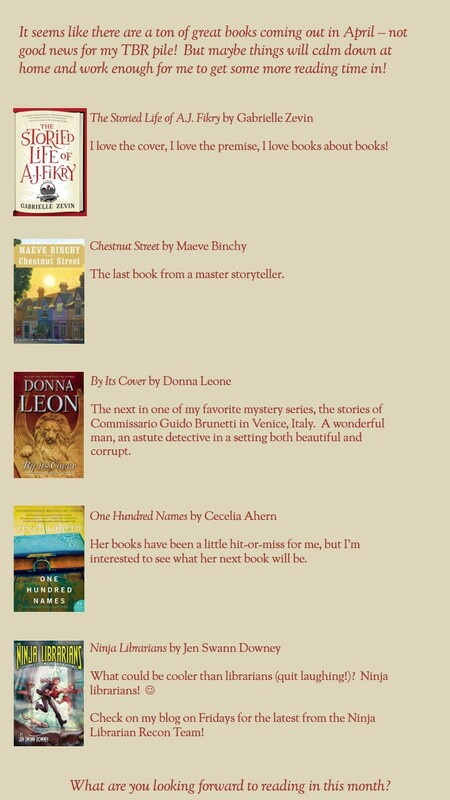 What are you looking forward to reading this spring? The Storied Life of A.J. 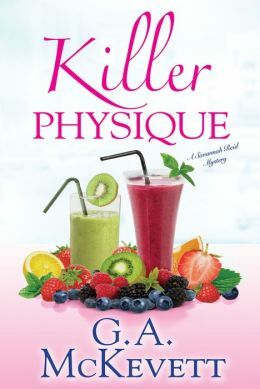 Fikry by Gabrielle Zevin – A novel about bookstores – how can I resist?! And it sounds like an interesting story, too. One Hundred Names by Cecelia Ahern –Ahern’s books always have a unique perspective on life. The Blazing World by Siri Hustvedt – The next book in my Indiespensables subscription which rarely disappoints! The Ninja Librarians by Jen Swann Downey – Sorry, I can’t help it! When I told my husband I wanted this book, he told me I already have too many books. My argument? None of them are about Ninja Librarians! 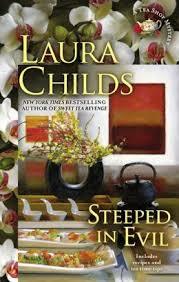 And a bunch of books in series that I read are coming out this spring! Field of Prey by John Sandford – I didn’t love his last book, but I have always liked the Lucas Davenport books in the past, so I’m giving him another chance! Robert B. Parker’s Cheap Shot by Ace Atkins – Ahh… the chance to hang with Spencer and Hawk again! In the Morning I’ll Be Gone by Adrian McKinty – The last book in The Trouble Trilogy, it will be interesting to see where Sean Duffy, a Catholic cop in the Protestant police force in Northern Ireland in the early 1980s, will end up. 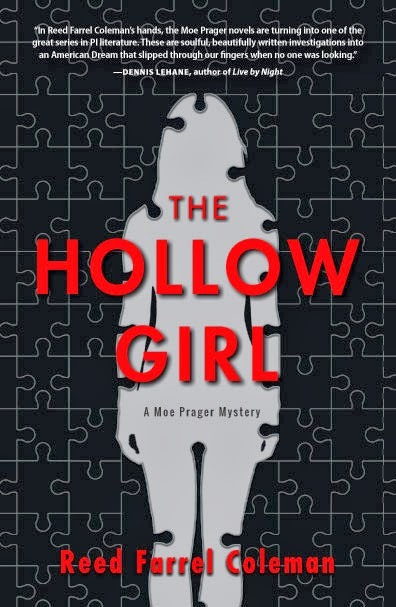 The Hollow Girl by Reed Farrel Coleman – I am so excited to read this book, but so sad to see the end of the Moe Prager series, one of the best detective series ever written. Allegiant by Veronica Roth – The final book is out! And as soon as my daughter is done with it, I will take my turn! Dream Thieves by Maggie Stiefvater – A fun series – – I’m not “dying” to read the next book, but it should be entertaining. Fall of Five by Pittacus Lore – See #2. Just One More Year by Gayle Forman – I read the first book in the series, Just One Day, without realizing it was part of a series, so now I want to know the end of the story! Next-in-Series Adult Fiction – Coming Soon! Takedown Twenty by Janet Evanovich – Always hilarious and books that I always am excited for each November. Sycamore Row by John Grisham – John Grisham returns to the setting of A Time to Kill, one of my favorite Grisham novels. Eden in Winter by Richard North Patterson – I’m really reaching now, since this book doesn’t come out until July 2014, but I really enjoyed the different directions he took with the first two novels, Fall from Grace and Loss of Innocence, and am looking forward to seeing where he goes now. 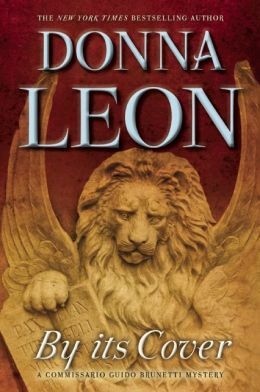 By Its Cover by Donna Leone – The next book in the Commissario Guido Brunetti series isn’t due out until April 2014, but I am ready for another dose of Venice!